Manchester United legend Paul Scholes had announced his retirement at the end of the 2010-11 season having won the Premier League title and played in the final of the Champions League where United were defeated by a Lionel Messi powered FC Barcelona. Six months later, with United in crisis in central midfield, Scholes came out of retirement, famously turning up at the Carrington, having purchased his boots from a local sports shop. He played for another season and a half for the club and retired at the very top at the close of the 2012-13 season with another Premier League medal strapped around his neck. Note: This list excludes players who moved to China or the Middle East during their peak years on a lucrative contract. In January 2015, Major League Soccer club Los Angeles Galaxy announced the signing of Liverpool FC icon Steven Gerrard on an 18 month ‘Designated Player’ contract reportedly worth $9 million. He made his MLS debut in July 2015 and was named in the MLS All-Star roster following his stellar performances, scoring one and setting up another for former Liverpool teammate Robbie Keane against the San Jose Earthquakes which resulted in a 5-2 victory for Galaxy. He scored another goal, the winner against FC Dallas, across 13 appearances in the regular MLS season. However, the Galaxy were eliminated from the MLS Cup by Seattle Sounders. 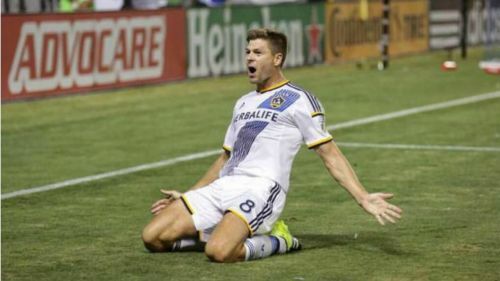 In the 2016 MLS season, Gerrard made 21 appearances, scoring 3 goals as LA Galaxy crashed out of the MLS Cup playoffs in a penalty shootout loss to the Colorado Rapids in November. A week later, Gerrard announced that he’d be leaving the club when his contract expired. Later that month, Gerrard announced his retirement from the game. He is presently the manager of the Scottish Premiership Club Rangers.